February | 2015 | Love Those "Hands at Home"
You plan. You do research. You expend energy, to go to just the exhibit or gallery show you know you need to see. But sometimes serendipity steps in and you just happen to be in an unexpected place, to see an unexpected display of something wonderful. We were in Bonsecours Market in Montreal in September. We never go to Bonsecours Market, with its trendy, expensive shops—a bit much for our tastes. 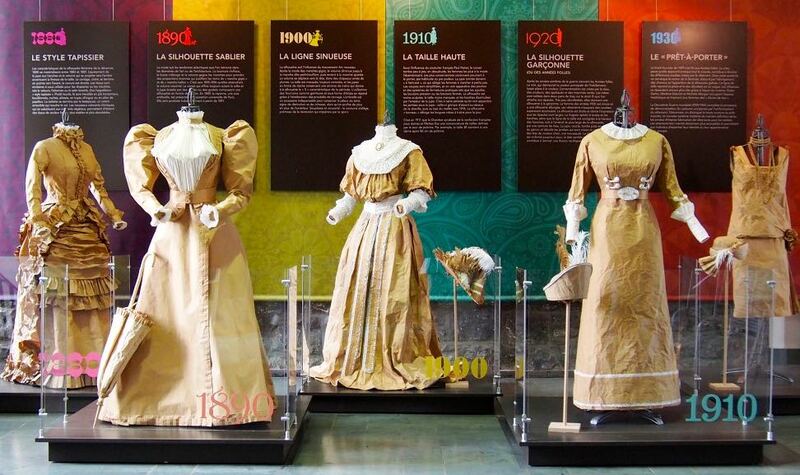 The exhibit was presented by The Museum of Costume and Textile of Québec, to illustrate the evolution of women’s fashion in the province of Quebec between 1880 and 1930. The five dress reproductions were made entirely of paper by costume maker Michael Slack. Because the dresses were all made of simple paper, the focus was on style, not on fabric textures or colors or prints. The degree of evolution, from voluminous and fussy to body revealing and sleek, was highlighted . . . and dramatic. Lessons learned–keep your eyes open and your camera at hand. Serendipity rules! A hardworking, conscientious girl. A boy with a massive crush. The sweet story of young love. How do you capture that in a few stitches? It can be done—just look at these funny towels! A great many vintage items pass through my hands, as I poke around garage sales and thrift shops and as others scavenge for me, as well. I can’t keep everything, of course, so I sell a lot of what I find and keep only what I consider to be really special. But sometimes I don’t realize a thing is special until it’s gone. Absence, it seems, really can make the heart grow fonder. Such is the case with these adorable towels. My mother picked these up for me, at a bargain price, from a white elephant sale—one look told her they were not to be left behind. 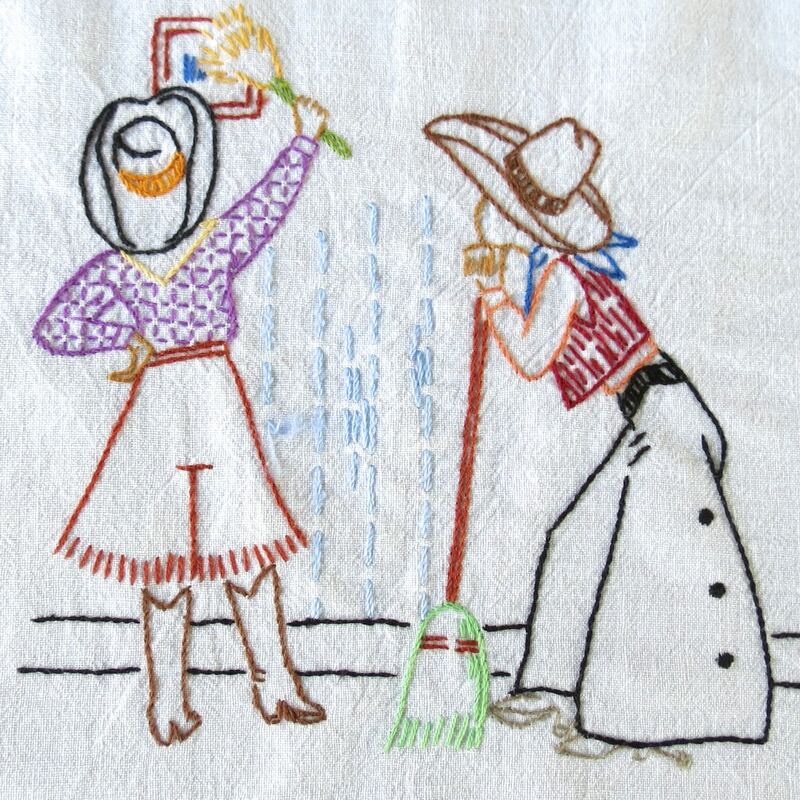 These three towels were probably originally part of a set of 6 or 7 “day of the week” towels, each depicting a housekeeping chore assigned to a different day of the week. 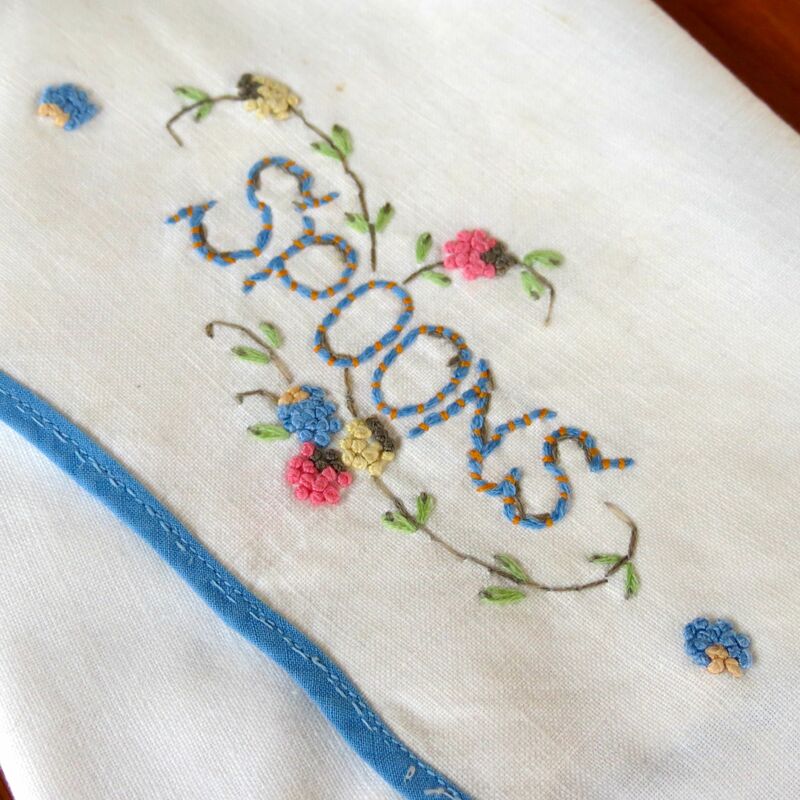 Towels like these were popular in the 1940 and ‘50s and many iron-on patterns were sold, so a person could make her own set according to her tastes. Of all the many sets I’ve seen, this is one of my very favorites. 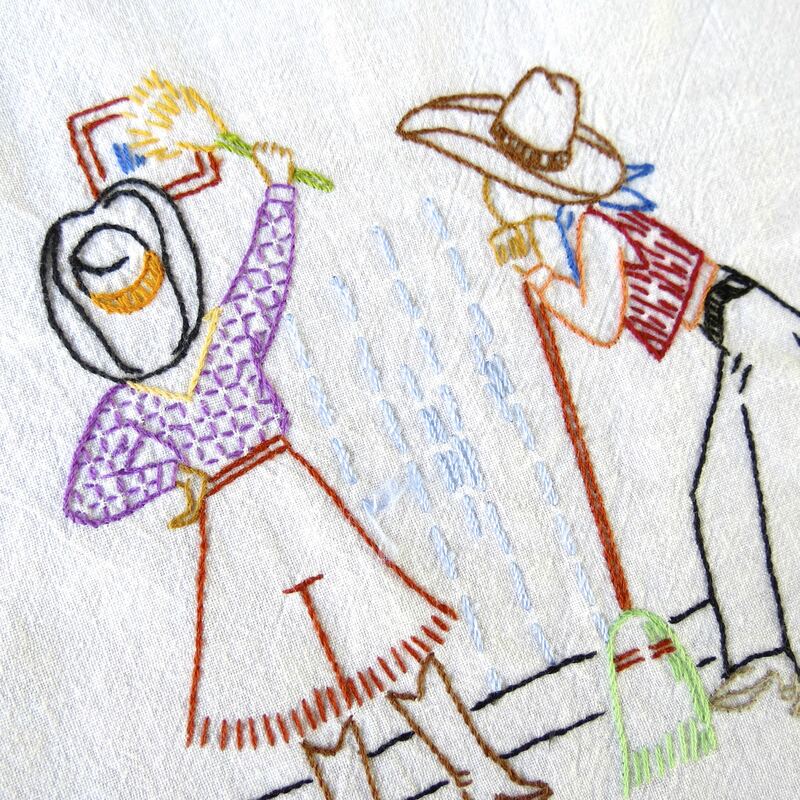 I love these towels for the craftsmanship and the details that are included—just look at the boy’s tiny spurs and bandana and the fringe on the girl’s split skirt! But I love them even more for the narrative contained in them, the story between the boy and girl that we’re invited to participate in. It’s that age-old story of puppy love! 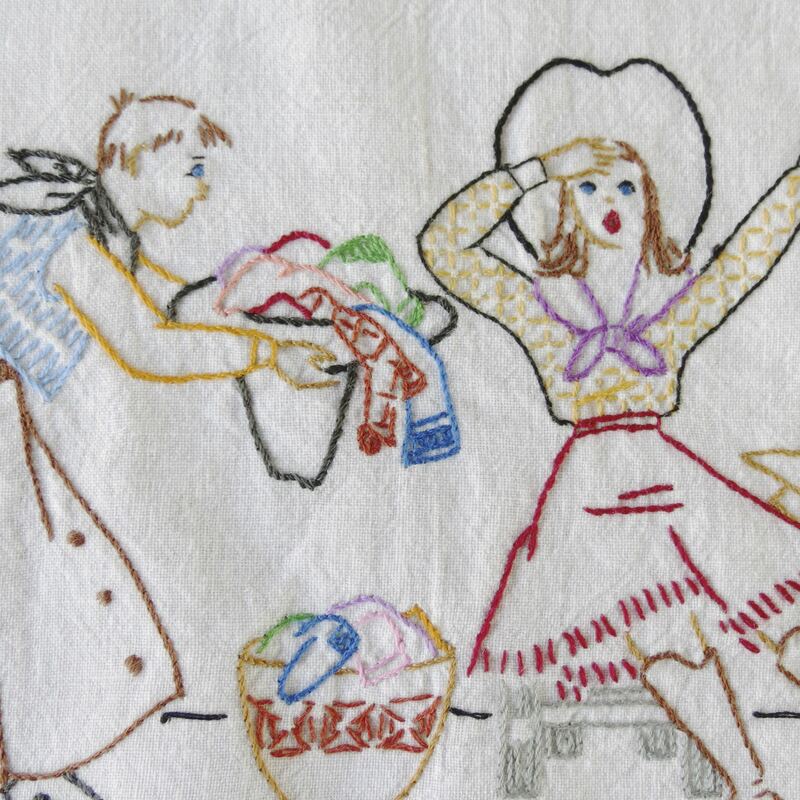 Some people might look at these towels and say they simply reinforce negative, outdated gender stereotypes—a boy bringing a girl his mending and ironing, while he dawdles around, getting in the way. He takes a broom and offers to help with the cleaning, but it’s only a ruse to stand by and moon over the object of his affections. And she, playing hard to get, turns her back and pretends she doesn’t know the turmoil he’s experiencing. She tries to iron and he shows off for her, trying to impress her with his skills with a lariat. You can almost hear her saying, “Get away, I have work to do!,” while she secretly loves every moment. It’s all here—drama, emotion, whimsy, the human story. And it’s an ongoing story, developing over the days, as their clothes change in every setting. I also can’t help but wonder, when I think of these towels, about the loving hands that did the careful stitching. 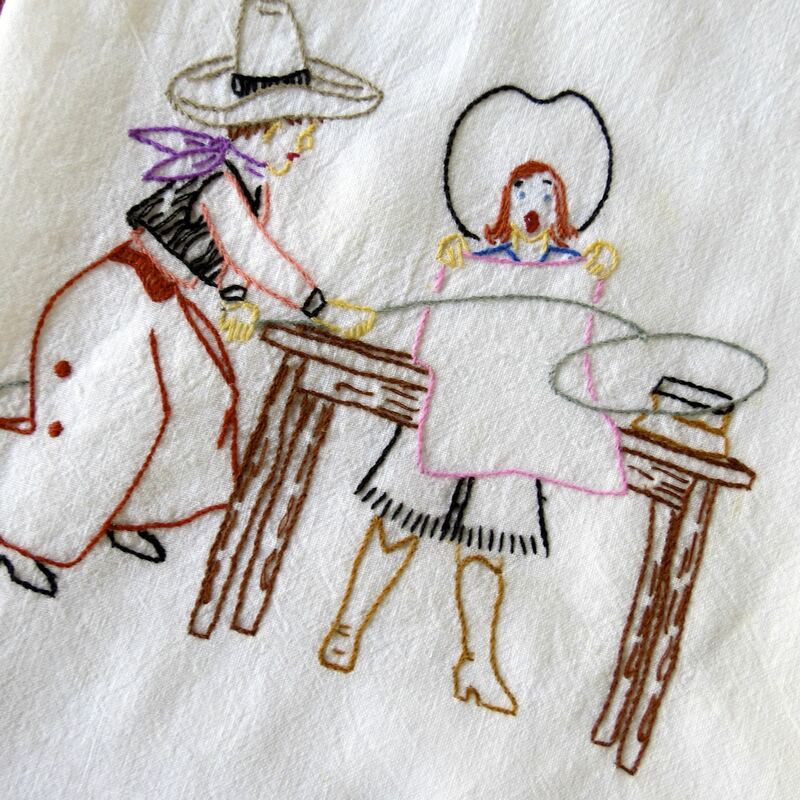 Was the maker a young woman, stitching a romantic story and hoping it would materialize in her life? Was she a new wife, feathering her nest and honoring the thrill of a recent courtship? Or was the maker a care-worn housewife, reliving the sweet memories of what she felt when she first met her husband? For this little cowgirl and cowboy, the moment never passes, the bloom never leaves the flower of first love. I hope the new owner of these towels loves them and the story they tell! Just Another Blogger . 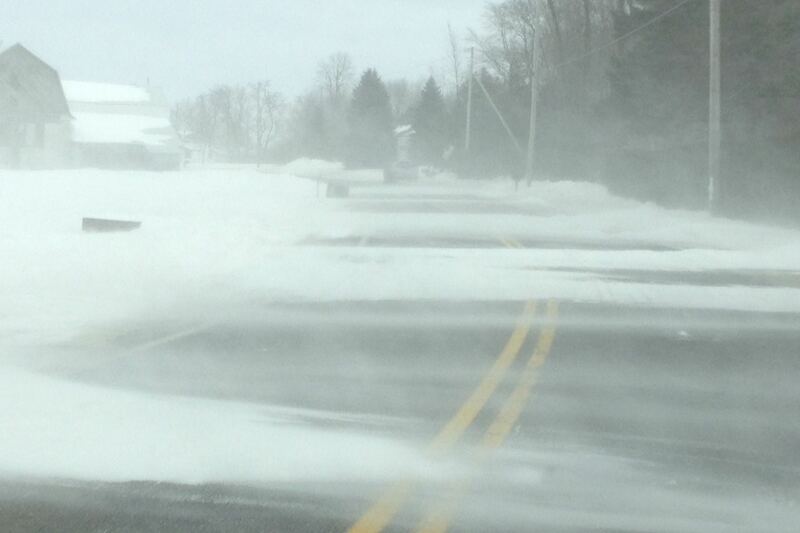 . .
Just another set of photos, from just another winter-weary blogger. with unreality . . .
And then I remember when I was that age, when the happiest occasion in my life was to go to the penny candy store and stock up on treats that were garishly colored, unremitting, unrepentant sugar. Pure crap. Our penny candy store was not beyond the El. We grew up on that farm I am always talking about and the nearest store, about 8 miles away, was a small, old-fashioned corner store run by the Delormes. This kind of store was the more honest, more interesting version of today’s convenience stores. It was small and carried everyday items. It had a wooden floor that buckled and heaved as the temperatures changed and it had twine, for wrapping your parcels, in a dispenser hanging from the ceiling. 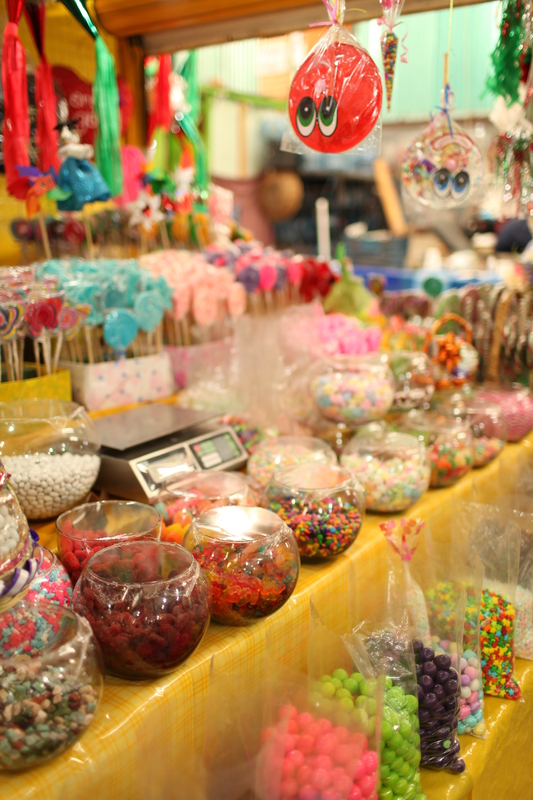 But I’m surprised I even remember those details because when I went to Delormes’ store, I only had eyes for the candy. The candy was behind the counter but kids were allowed to go back there to feast their eyes on an array of pure bliss, and to make their momentous choices. The choices weren’t easy. Delormes had it all. Those little dots of hard frosting on paper that you peeled off, sometimes getting a shred of paper on your tongue with the candy. Those paper straws full of powdered candy that you poured into your mouth to mix with your saliva and create a sludge that was hard to swallow. I wonder how many kids got vestiges of that powder into their lungs. Those candy necklaces, little disks of colored candy strung on an elastic cord, that you could wear around your neck or your wrist. I know from experience that, if you wore it around our neck, you could stretch it up to reach your mouth in order to munch away. The string got sticky and wet and then got tangled up in your hair and made it sticky and wet. Incredibly unhygienic. The store had red and black licorice sticks, of course, unwrapped so you could buy a few and not use all your pennies on a full packet. They had Bonomo taffy and red hot dollars and atomic fire balls and peppermint patties. And Mary Janes, although I would never choose those! My sister and I loved the Mallo Cups, which cost 5 cents but were worth it.. A Mallo Cup, for the uninitiated, is a perfect cup of milk chocolate, studded with toasted coconut and filled inside with marshmallow crème. And, AND, in the Mallo Cup package, you always got a little cardboard coupon. When you collected enough cardboard coupons, you could send them in and redeem them for more Mallo Cups! Free! For two nerdy little farm girls, getting a package in the mail with free Mallo Cups was about as thrilling as life got. A trip to Delormes meant you left with a small brown paper sack, stuffed with goodies. If you were really lucky, your grandmother or mother would buy you a Fudgsicle to eat right away so you could save your candy for later. You would sit with your sister, just you two in the parlor on the blue Oriental rug, and review and your compare your purchases. You might trade or split some candy to share. You would always try to make your last longer than hers, so you could gloat. Ferlinghetti says that the penny candy store is where he first fell in love with unreality. The whole concept of penny candy certainly feels unreal now. It’s unreal to think of buying anything for a penny. It’s unreal to think that the candy would be there in bins, open to the air and dozens of grimy little hands. It felt unreal to us then, too, but in wonderful, magical ways. Unreal that you could feel so rich, with just a quarter to your name. Unreal that the candy was colorful and whimsical and so varied that a person’s goal for their whole childhood could be to try every single one. Unreal that such a simple thing could provide such silly, simple joy that the memory has lasted my entire life. Did you have a penny candy store to go to when you were little? Do you even remember penny candy? As I iron my thoughts wander, all around the world. I think about how my linens have traveled, and I wonder where the next ones will go. My linens been many more places than I have! These napkins are on their way to Norway. These perfect, exquisite cocktail napkins just went to Abu Dhabi. I got his flat-out gorgeous set from a woman whose grandfather was a linen importer. So the placemats and napkins made the trip to the U.S. from another country, I can’t guess where, but now they grace a table in Australia. 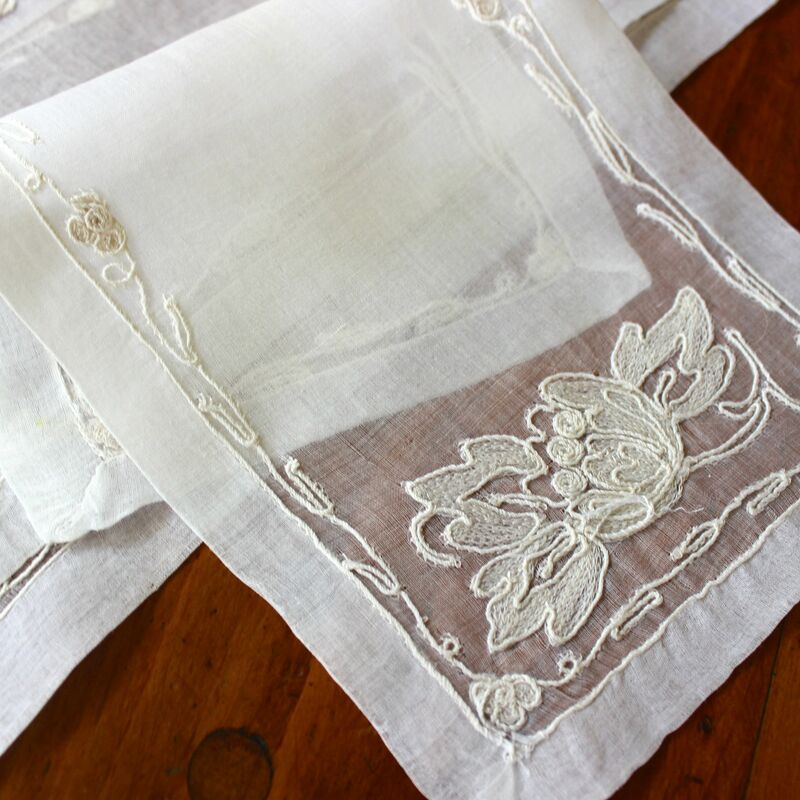 It never occurred to me, when I started selling vintage linens, that I’d be sending these lovely things around the world, to Japan, to New Zealand, to Italy, to South Korea. Not only are they valued in many lands, they are valued so much that people are willing to pay the often exorbitant shipping costs. I ask myself why? Why would international buyers want these items? Maybe it’s because some of the countries are young-ish, like Australia and New Zealand, and have less homegrown vintage than we do. Maybe it’s because American culture and design, at least from certain periods, has a vibe that folks in other cultures value. I can make some generalizations—Australians go for understated elegance. 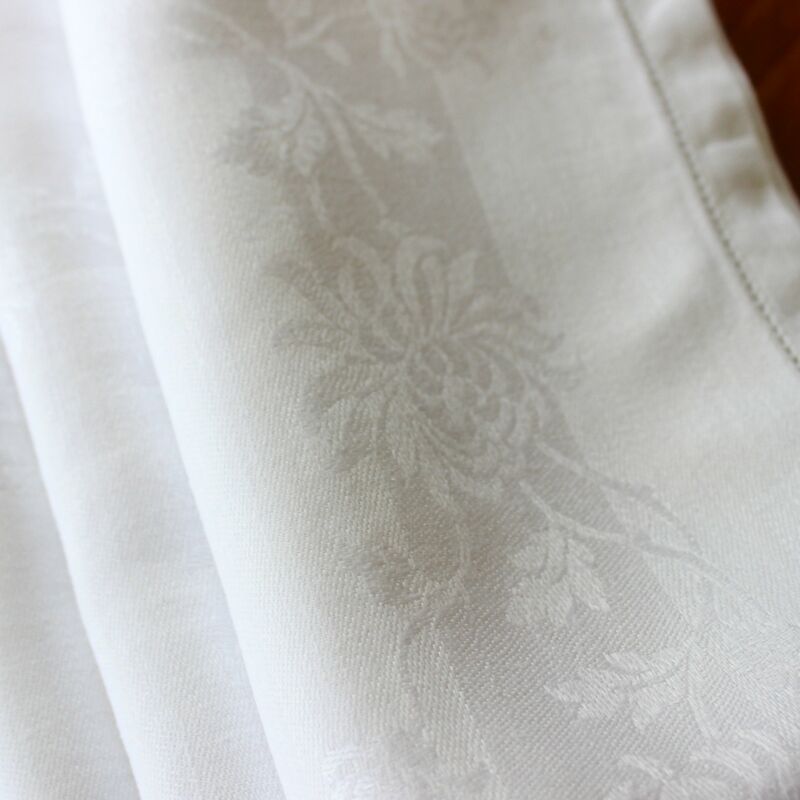 Usually all white, high-quality, and expensive linens that bespeak an old-world charm. Many Asian buyers like the funkier look of American mid-century. I have my ethnocentric moments, when I think, “Oh, but this belongs here. I don’t want it to go to another land, far from its home.” And then I remind myself that valued items have been traded across the world from time immemorial. If we could have a Silk Road, why not a Linens Road? And I remind myself that the really important thing is that these pretty things be loved and valued and used, wherever they find a home. This little, bitty, pretty one, a spoon keeper, is on its way to New Zealand. It will have a loving home where it will, once again, protect treasured spoons and be treasured itself. Goodbye linens! Safe travels! Fare thee well. Rapunzel Weaves . 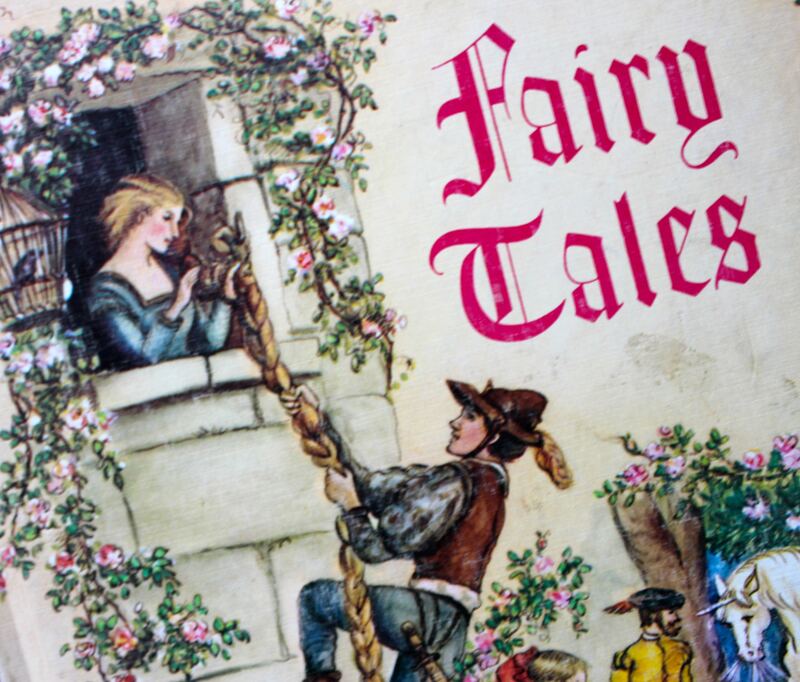 . .
As a child, I was enthralled by fairy tales. I loved them all, from the grim and scary Grimms to the pasteurized versions from Disney. I spent a lot of time with this beautiful book. I knew that it was gift from my paternal grandmother; the inscription reminds me that I was eight years old when I received it. 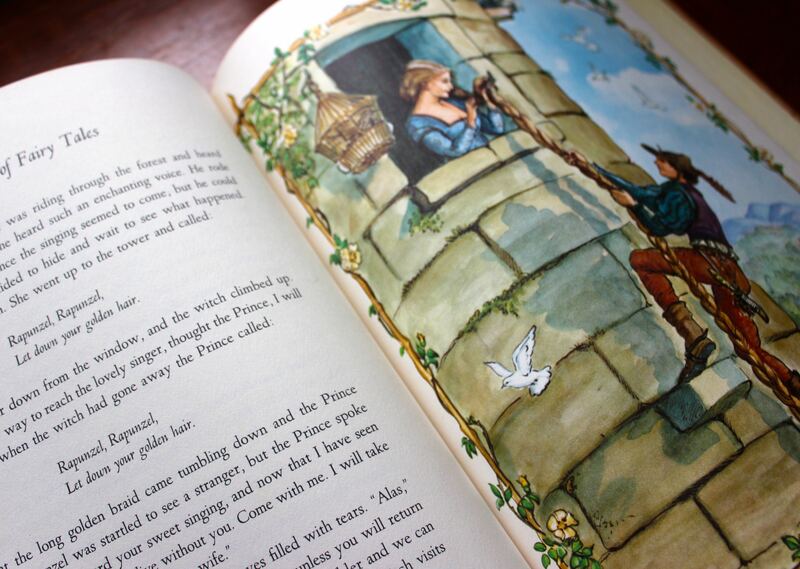 The book has many of the stories I loved—Sleeping Beauty, The Valiant Tailor, Red Riding Hood—all illustrated by Tasha Tudor in her captivating style. And Rapunzel. Oh, I loved Rapunzel, with her sad, lonely life and that beautiful hair. I spent hours with this illustration, absorbing every detail, enjoying the romance of it all. 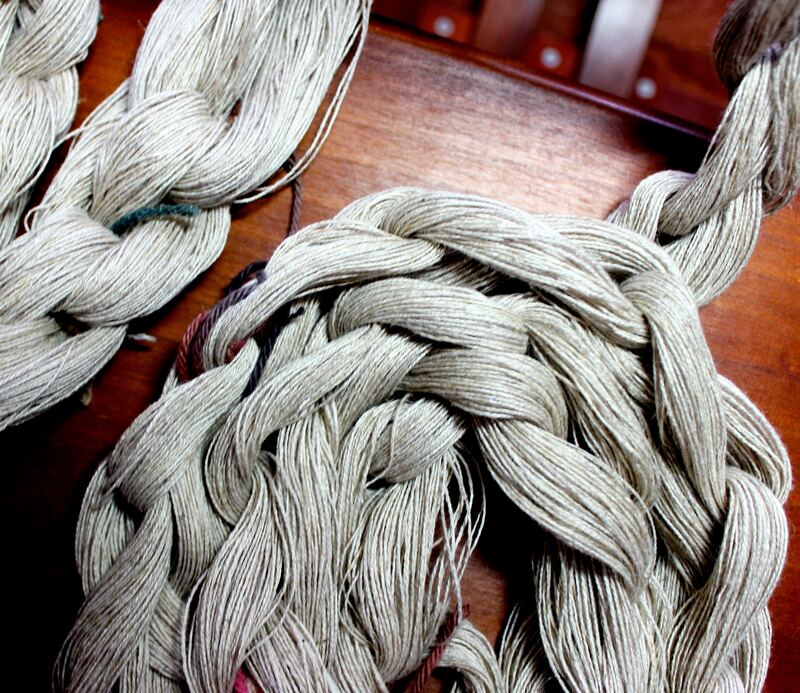 Is it any surprise that, as I started a new weaving project and made the long, long warp threads into a chain to prevent them from tangling, all I could think of was Rapunzel? And do you remember what Rapunzel did, to try to effect her escape? 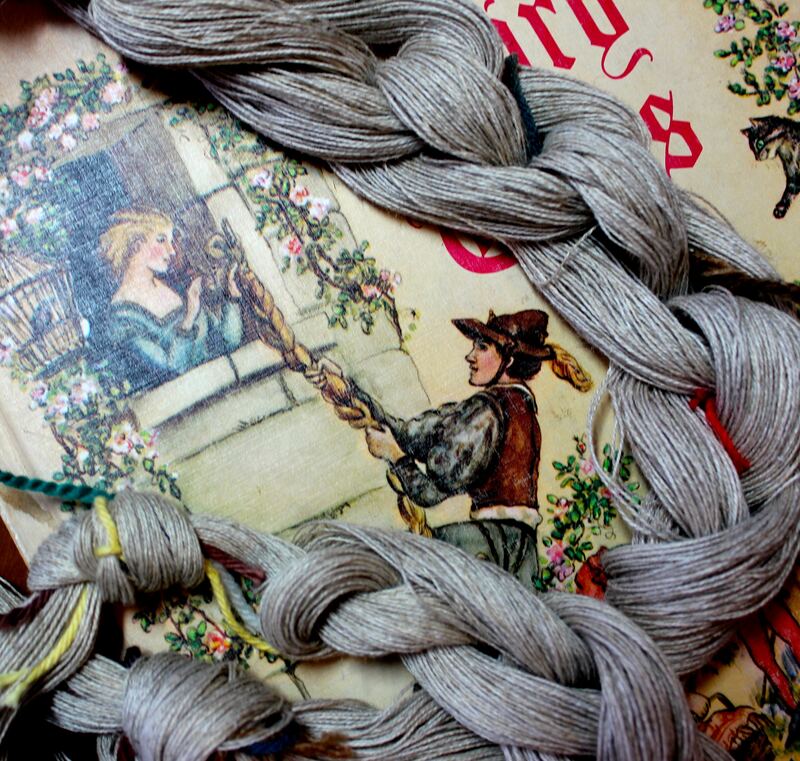 Her suitor brought her silk thread every time he climbed her braid to visit and . 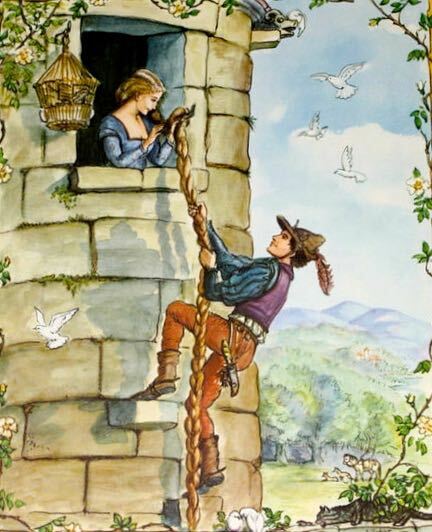 . .
Rapunzel wove. She wove a silken ladder, with hopes to use it to escape. I won’t weave a ladder but the simple, repetitive act of weaving, of throwing the shuttle and watching the fabric grow, will allow me to escape for a bit, into memory, into nostalgia, into whimsy.